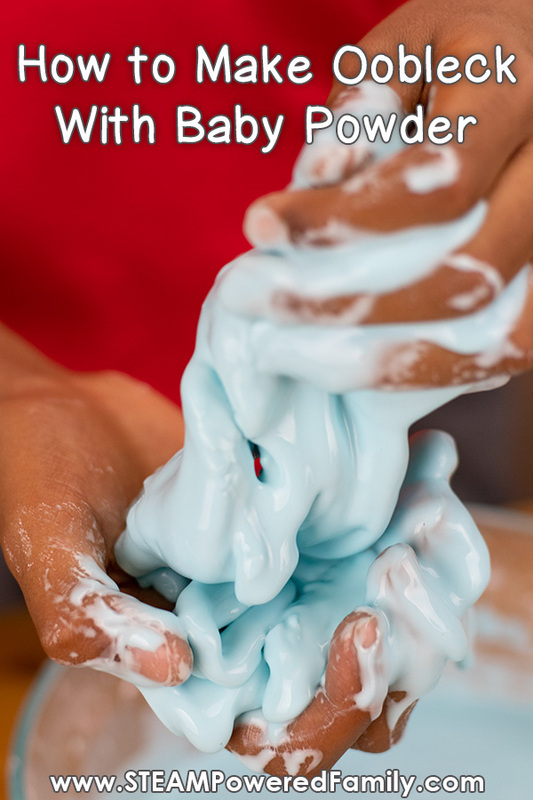 Baby powder, it is a distinctive smell that most people will know anywhere. But did you know baby powder also has some fascinating science applications? 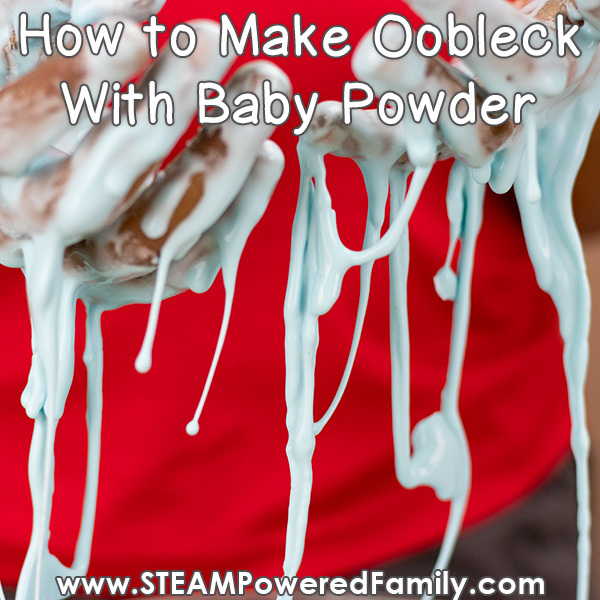 In fact, you can use baby powder to make a brilliant batch of oobleck. Baby powder has a fascinating history. It first came on the market in the late 1800’s. The main ingredient was Talc (or Talcum Powder) which was the powder form of a mineral rich in magnesium. For many decades the product was the same and a staple in many households. However in recent decades some concerns have come forward about a possible link to cancer. 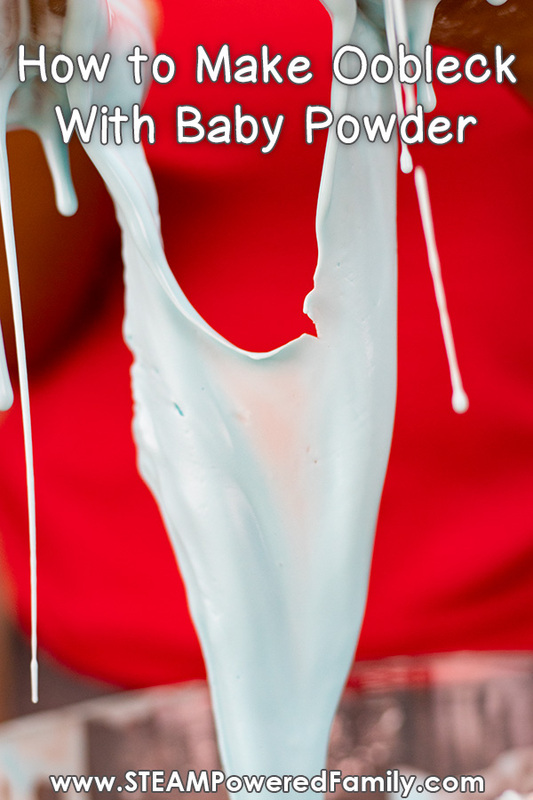 Now many baby powders use cornstarch instead in their recipes. 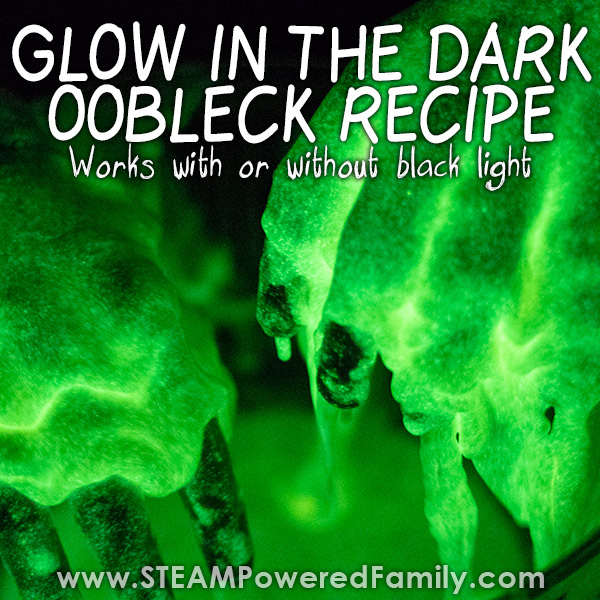 And we all know what cornstarch is great for… making oobleck! Oh and I guess gravies and soups too. Our baby powder that we used for this experiment was 100% cornstarch with no talc in it at all. I don’t know how results may vary if you use a baby powder with talc. 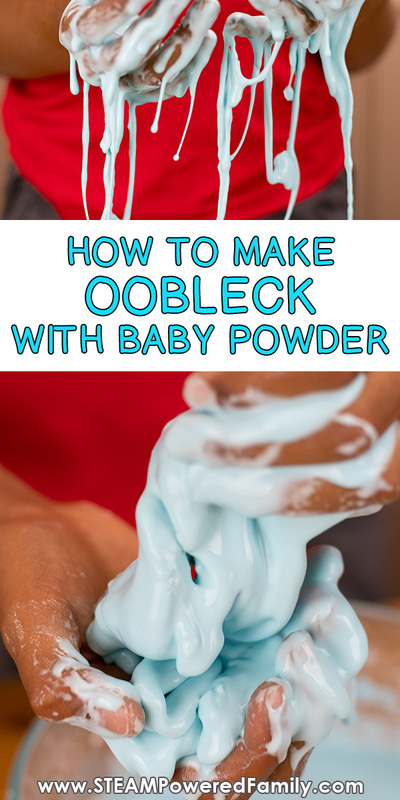 Our baby powder had other ingredients too, including aloe, fragrance and vitamin E.
When we set out to make oobleck with baby powder I wasn’t sure how the added ingredients would affect our recipe, but it turns out it didn’t affect it at all. We used our standard 2 cups of baby powder and 1 cup of water and it turned into a perfect non-Newtonian Fluid. It had all the normal properties of our regular oobleck and behaved exactly like our regular cornstarch recipe. So there were a couple of things we really didn’t like about making oobleck with baby powder. First, the stuff loves to get airborne. It was such a mess and we ended up inhaling a lot of baby powder. 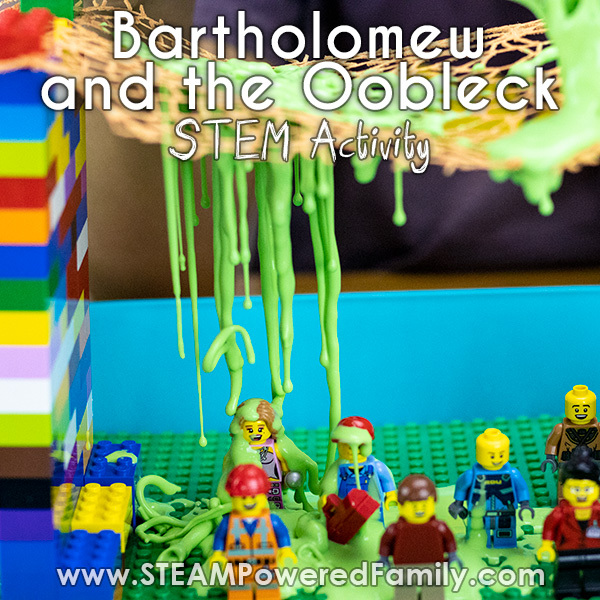 Making oobleck is normally a lot of fun, but that took a lot of the fun out of it for us. Second, this could be a plus to some people but for us was a huge negative. The smell. 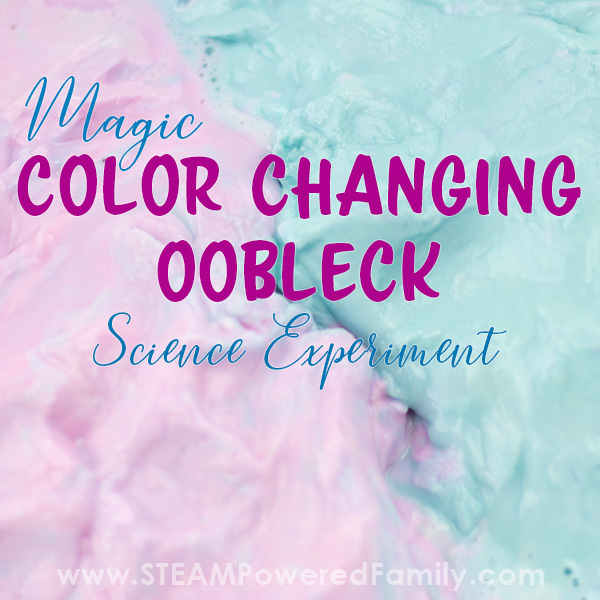 Baby powder in small quantities has an okay smell, but when you whip up a batch of oobleck using 2 cups of the stuff the smell is a little overwhelming. 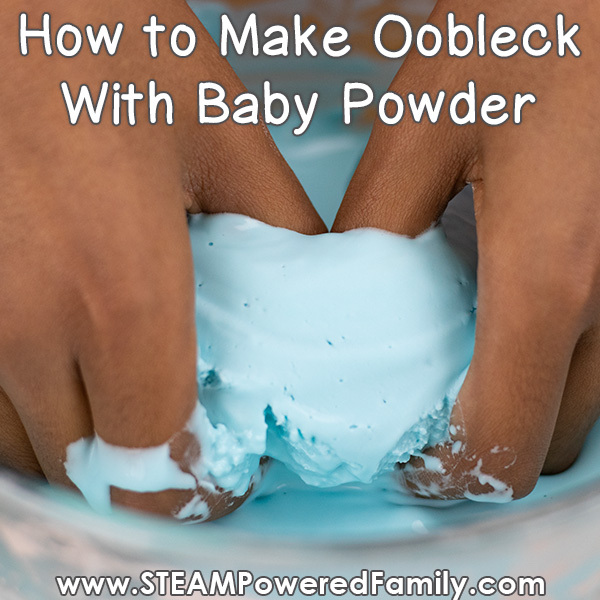 Can you use baby powder to make oobleck? Absolutely! But I wouldn’t recommend buying baby powder to make oobleck, just buy straight corn starch. It is cheaper, easier to work with and will give you the same result.